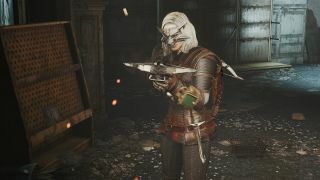 The “Geralt's Prologue Gear” mod adds the Witcher crossbow, Geralt's outfit, and the Witcher wolf mask to Fallout 4. The weapon and outfit are available in different models and colors, while the mask has selectable eye designs. And based on the teaser video, they look great—mainly because they're built on the original models and textures used in The Witcher 3. The mod maker, Renn, linked to an image of an email he received granting him permission to use the assets, something CD Projekt said it normally doesn't allow. “We can make an exception and allow you to use The Witcher assets in accordance with what is in your email below and within this scope. Please just make sure that you do not create any kind of impression that CD Projekt SA is your official partner, co-author of your derivative work, or that it assumes any responsibility for the result of your work,” the studio wrote. It also asked that he ensure it's not used for anything “racist, xenophobic, sexist, defamatory or otherwise offensive or illegal,” and of course that it not be used for commercial purposes. Solid move, guys. The Geralt's Prologue Gears mod for Fallout 4 is available from Nexus Mods.